Dudley K. Woodward (1881 – 1967) was a prominent Dallas attorney and Chairman of the Board of Regents of The University of Texas from 1944 to 1955. He graduated from The University of Texas in 1901 with a Bachelor of Liberal Arts degree and earned his Juris Doctor at the University of Chicago Law School in 1907. The Dudley K. Woodward Jr. Scholarship Fund was established on September 21, 2000 by the Board of Regents for the benefit of students of The University of Texas School of Law, and in 2016 the Tarlton Law Library became the steward of the Dudley K. Woodward Papers. In a quarter century of service, spanning changing political and social climates, Dudley Woodward shepherded The University of Texas through various crises with a steady hand. 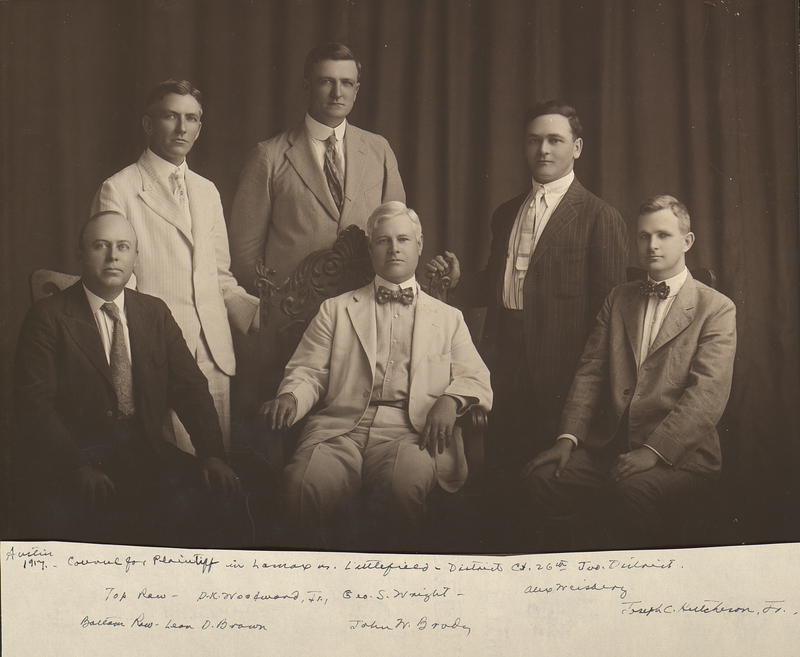 In 1917, while serving as the president of The University of Texas Ex-Students' Association, Woodward successfully worked against Governor James E. Ferguson’s attempt to defund The University of Texas System. In 1944, he again answered the call to public service, leaving a successful law practice to serve on The University of Texas Board of Regents at a time when the Regents were embroiled in controversy and badly needed leadership. Woodward accepted the appointment, as he said to the Dallas Times Herald in 1954, because no one else would take the job: “I told Governor Stevenson he had to work his way down to the Ws [sic] before he came to me." Regent Woodward’s leadership steered the university through the tumultuous days of the "Rainey Academic Freedom Controversy," and other upheavals of that era. As chairman of the Board of Regents, one of Woodward’s first actions was to oversee the official firing (or non-reinstatement) of University President Homer P. Rainey. Writings and correspondence in the Dudley K. Woodward Papers show how seriously he considered the issue before reaching his decision. His address to the Texas Legislature at the time, "Reasons of Dudley K. Woodward, Jr., Chairman of the Board of Regents of The University of Texas, for voting against the election of Dr. Homer P. Rainey as President of The University of Texas," was bound and published, and is available for viewing in the Tarlton Law Library's Special Collections department. In a 1952 letter to University President Theophilus Painter, Woodward writes, "Out of that time of chaos we have brought the University back to its rightful place among the great universities of the world." After his decade of service leading the Board of Regents, Woodward left the board but remained a champion of university interests, tirelessly promoting his vision of higher education in Texas. His work in the 1960s to separate the Permanent University Fund from the control of the Texas Legislature helped secure the financial future of The University of Texas System into the next century. Upon his retirement as chairman of the Board of Regents in 1964, the Dallas Morning News said of him, "Dudley K. Woodward, in his years of wise counsel and sound judgment on the University of Texas Board of Regents, has freely given his best to Texas. In aftertime it will be reckoned a magnificent gift." With years of law practice and public service behind him, not to mention other charitable and philanthropic endeavors, Woodward’s circle of friends and acquaintances comprised a veritable Who’s Who of mid-century Texas. Until his death in 1967, Woodward was a diligent and faithful correspondent. From oil and lumber tycoons to governors and chancellors, such notable Texans as Ima Hogg, Charles L. Black, and Roy Bedichek exchanged letters with Woodward. These letters, discussing state and national politics, his days at The University of Texas and the University of Chicago School of Law, and his hopes for the future of higher education in Texas, now make up one of the most noteworthy aspects of this collection. 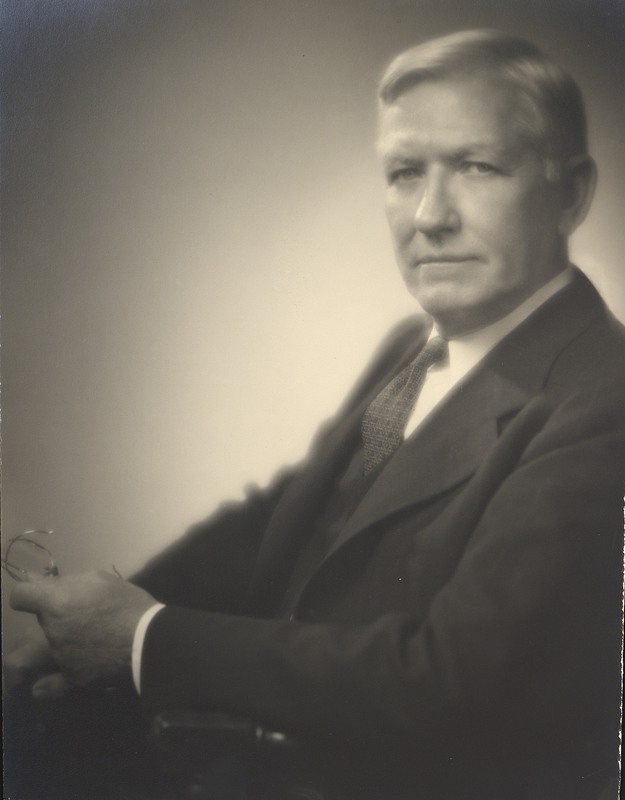 Dudley K. Woodward was a vocal proponent of public service and specifically service to The University of Texas System. The collection contains drafts and printings of some of his many speeches on the future of The University of Texas and his often repeated exhortation that it was the duty of Texans to take it "From Good to Great." View the finding aid for the Dudley K. Woodward Papers.